Why the cooler does not work? Description: Why the fan does not run? Why the temperature does not go down? Make sure a 12V DC power cable is connected and the red LED is on. You can use an AC-DC adapter, or a 9V-15V battery. And the connector must be a 2.1×5.5mm center positive standard. The red LED indicates that the external power supply works. If the cooling temperature does not change, but the cooling power rise and reach 100%, and the camera body is warm the Temperature sensor probably is damaged. 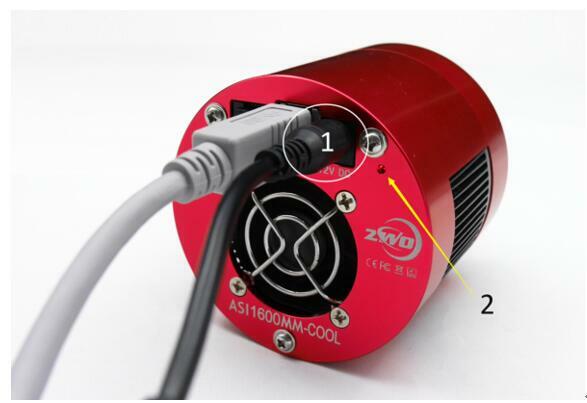 If the cooling temperature does not change, but cooling power rises and reaches 100%. And camera body does not getting warm, the power chip probably is damaged. Try another power adapter to check. 2 Responses to Why the cooler does not work? The fan on my new ASI 294 MC Pro doesn’t work, The red power light comes on but the fan doesn’t. Please reconnect the fan plug, see if the problem stills.